Grammy Awards won by Peabo Bryson for "Beauty and the Beast" and "A Whole New World" will be auctioned Friday and Saturday to help pay his $1.2 million tax debt. The auction also will include a grand piano, the keys to the city of Miami, several gold records, a sound board and mixer, African art, hundreds of shoes, a large old-fashioned wood bed and a yellow-and-black spotted Italian jacket. Bryson, 52, won a Grammy in 1992 for his recording of "Beauty and the Beast" with Celine Dion and another in 1993 for "A Whole New World (Aladdin's Theme)" with Regina Belle. Some of Bryson's most popular songs include "Just Another Day," "If Ever You're In My Arms Again," the 1983 duet "Tonight I Celebrate My Love For You," with Roberta Flack, and "I'm So Into You," which rose to number two on the charts four years earlier. 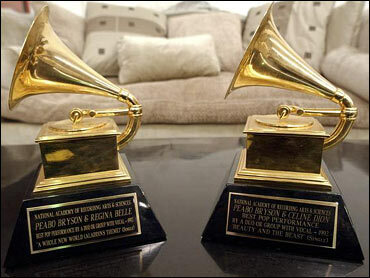 The Internal Revenue Service wouldn't say what the starting bids for Bryson's Grammy trophies will be. "We would like for the items that will be auctioned off to satisfy the debt that is owed the federal government. Will they? We don't know yet," IRS spokesman Mark Green said Thursday. All of Bryson's property was seized from his Atlanta home Aug. 21 for back taxes owed since 1984, Green said. Neither Bryson nor his lawyer were available for comment Thursday. "This is the last resort with any taxpayer," said Eric Erickson of the IRS.